Move over Sermo…Hello Therapydia, a new health care online community created to connect physical therapists. The site's goal is to mobilize all US PTs using social media to address key industry issues and elevate the profession. It aggregates relevant content from 300 sites and offers a free assessment tool to aid PTs in building a professional branding online. Site expansion will include patients, referring physicians and related wellness practitioners to benefit site users with potential referrals and patient engagement. 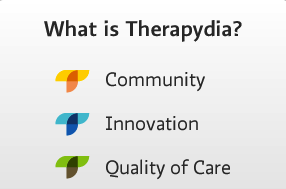 Therapydia is backed with $5M from Peterson Ventures, de Anda Capital and Western Technology Investment. Urgent care chain, Physicians Immediate Care (PIC), is now better equipped to increase its Midwest presence thanks to new investors LLR Partners, Wellpoint and former Walgreen's executive, Stanley Blaylock. Hill-Rom, a hospital bed and equipment supplier since 1939, enhanced its existing surgical platform with the acquisition of privately-held Aspen Surgical for $400M. Aspen Surgical is a leader in surgical and specialty medical products including scalpels, operating room disposables and instruments and wound care products. Hill-Rom's move should be a positive one as growth of the disposable medical supplies market is anticipated based on aging demographic patterns, extended insurance coverage by Affordable Care Act, and rising incidence of disease and disorders. The market is forecast to increase 4.3% annually to $47B in 2016. "With the addition of Aspen Surgical, Hill-Rom is well positioned for growth and geographic expansion in our surgical business, particularly in the safety product segments," said John J. Greisch, President and CEO of Hill-Rom. Unless you've been under a rock, you know that the Supreme Court upheld the Affordable Care Act in late June. Analysts expect the ruling to spur consolidation of health care companies looking to cash in on an increase in Medicaid enrollment. Wellpoint led the way with its $4.9B acquisition of Amerigroup. Antoine Gara's article (Health Care: Obamacare M&A Trumps Weak Earnings Outlook) suggests Humana, Cigna, Aetna and UnitedHealth could follow suit. Recent comments regarding Centene may have elevated it to the takeover target frontrunner. MedExpress Urgent Care recently selected Athenahealth for its cloud-based medical billing capabilities and live and automated patient communications service. 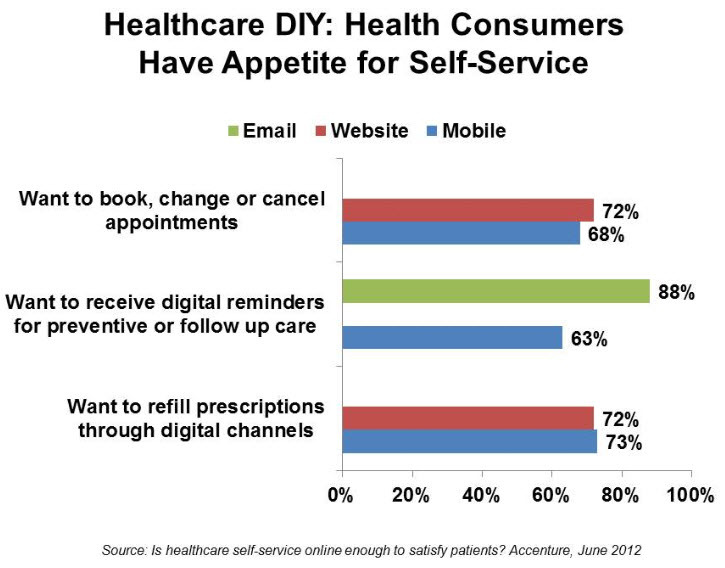 With increasing buzz around eHealth, the data points from a recent Accenture survey (June, 2012) are not too surprising. 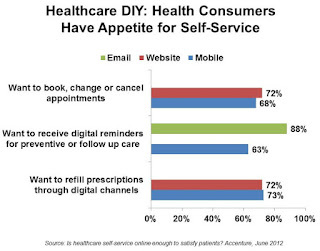 Survey results from, Is eHealth Enough to Satisfy Patients' Desire for Self-service?, indicate significant interest among consumers in online health communication. Despite privacy and regulatory concerns that have restrained its use to date, cloud computing in the health care industry is on the rise. MarketsandMarkets, in a recent research report, forecasted the health care cloud computing market to reach $5.4B by 2017, a compounded annual growth rate of 20% (vs. 4% in 2011). This global estimate encompasses use in clinical (e.g. : EHR, software imaging, physician order entry) and non-clinical (e.g. : patient billing, claims management) applications. GS Capital Partners acquired Drayer, a leading care provider in the outpatient rehabilitation market, from Linden Capital Partners. Based in Hummelstown, PA, Drayer owns or manages 80+ clinics that primarily treat sports-related injuries and orthopedic disorders. Clinics, located across 14 states, are in the Northeast, Mid-Atlantic, Southeast and Northwest U.S. With its new partner, Drayer's management will continue to focus on company growth, their patient-first culture and commitment to employees. Telemedicine – it’s not a new specialty, rather a means of delivering medical information...electronically (e.g. : telephones, website, email, webcams, etc.). A 2010 Intel survey of health care decision makers suggests that this emerging market will transform the health care industry in the next decade. In financial terms, a more recent study by BCC Research estimates growth of 18.6% from 2011 to 2016 to over $27B. What’s behind the growth? Joan Voight, CNBC.com in a recent post, Telemedicine: A Prescription For Lower Health-Care Costs? cites examples of satisfied small business owners. Along with employees enjoying the convenience of a virtual exam, health care providers are embracing the alternative delivery system. Although provider payment policies are evolving, many third party payers including Medicare and private health insurance plans are beginning to pay for online visits. Typically, the online rate is lower than a face-to-face visit but it’s better than no reimbursement at all.